A great way to dress up the entrance into a bedroom or bath. You will need to make sure that you apply the beaded fringe to the door frame away from the side the door is on, so that the door will shut securely. Measure the inside width of the door frame, most homes have 2'8" wide door openings. Cut the beaded fringe in the width of the door opening, plus 1". For this project you will need a ladder, glue that dries clear and tacks with an extended head so that they are easy to remove when the glue dries. Beginning on one side of the door frame, apply glue to the top edge of the outside of the door jamb - the opposite side in which the door opens. Fold the cut end of the ribbon for the corner. You will want to apply a dab of glue inside the fold of the ribbon as well as on the door jamb. Place one end of the cut ribbon in the corner against the glue, making sure that the ribbon is up against the side of the door jamb. Secure the end with two tacks. Moving along the inside of the frame, continue to apply the ribbon to the glue, adding tacks as needed. The heavier the beaded fringe, the more often you will want to use the tacks. Make sure that the ribbon is against the wood of the frame as it dries. Continue all the way across the top of the door jamb, adding glue and tacks as you go. When you reach the other side, cut the ribbon of the fringe about 1/2" longer than you need. Fold the cut end to meet the beginning of the ribbon in the corner. You will want to apply a dab of glue inside the fold of the ribbon as well as on the wall. Once the glue has dried, you can remove the tacks. Apply a decorative gimp over the ribbon of the beaded fringe in the same way. Some beaded fringe is made of acrylic and some of glass. The new acrylic beaded fringes have the sparkle of glass without the weight or the worry of breakage. Either is fine, however, some applications should definitely use acrylic beads due to the danger of breakage with glass beads. All of DecoratingStudio.com beaded fringe is made of a high quality, crystal clear acrylic. Often, the stated length of beaded fringe will include the tape or ribbon at the top. If length is critical, double check to see if the ribbon is included in the length dimension or not. All of Decorating Studio's stated beaded fringe lengths include the top ribbon or tape in the dimension. There are no right sides or wrong sides as far as the beaded part of beaded fringe goes; however sometimes, one side of the ribbon or tape holding the beads, may show the threads that are holding the beads to the ribbon. If the ribbon or tape part of your fringe has threads showing on one side, you should attach it to your projects so that the threads are down, hidden from view. If you are applying your beaded fringe to an object with glue, use a non-toxic, craft glue that dries clear and flexible. We recommend Aleene's Original Tacky Glue. You may want to secure the ribbon or tape to the item with straight pens until the glue dries to assure that the fringe doesn't slip out of place while drying. When applying beaded fringe with glue, it is helpful to first lay the ribbon or tape trim of the fringe on the item on which you are gluing it, then take a pencil and lightly mark the width of the ribbon on the item. This will assure that you have covered the area where the ribbon or tape will be with enough glue to secure the ribbon or tapes edges. When you are attaching beaded trim to an object that will get wet or requires washing, generally you will want to stitch the ribbon on instead of gluing, however, if you are attaching it to a glass or hard object that will get wet, use a suitable clear waterproof glue. These types of glues are often toxic, so use carefully and never on eating utensils. If you are attaching your beaded trim with a sewing machine, make sure that the beads are clear of the foot pedal, to eliminate breakage. Most beaded fringe has a decorative ribbon at the top, to which the beads are attached. In most cases, the ribbon is attractive enough to show. 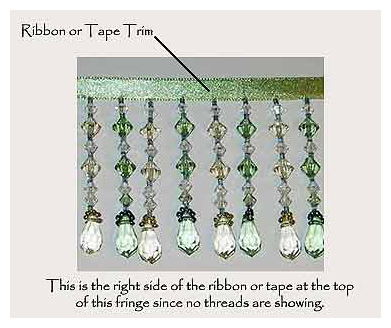 If you want another type of trim over the ribbon, you can easily attach a more decorative ribbon, braid or gimp over the beaded fringes' ribbon once you complete attaching the fringe. Never leave the ribbon or tape edge of the fringe exposed. Always allow a little extra so that you can turn the edge into a fold and secure with glue or thread. When measuring a round or oval object to determine how much fringe will be needed for a project (such as a lampshade edge), it is helpful to use a cloth tape measure and straight pins to secure it in place as you are measuring. While working on your project, if you find that midway through your beaded fringe one of the fringes is missing, cut one beaded fringe from the edge (with the ribbon or tape at the top) and sew it to the fringe area that is missing the beads.